Smollet was attacked on the street in Chicago in the early hours of Jan. 29 in what the police are investigating as a possible hate crime. The singer and actor (best known for his role as Jamal Lyon—a gay musician — in the Fox drama series Empire) corrected some early reports about the incident. He said he had gone to a doctor, and not a hospital, for treatment of bruised ribs. Smollet has confirmed that the men who attacked him hollered “MAGA,” the acronym for “Make American Great Again,” Donald Trump’s campaign slogan. Trump is one of several prominent politicians who have spoken out against the attack. Members of Smollet’s family also showed up at the Troubadour and spoke on the stage before his performance. #MeToo stands with you Jussie and all survivors of hate violence. Me demonstrated Saturday night RAIN or not! Link to video is in profile. This should put to rest the deceptive mantra “We now live in a post-gay era & we can live safely anywhere.” That is a deceptive & dangerous narrative. 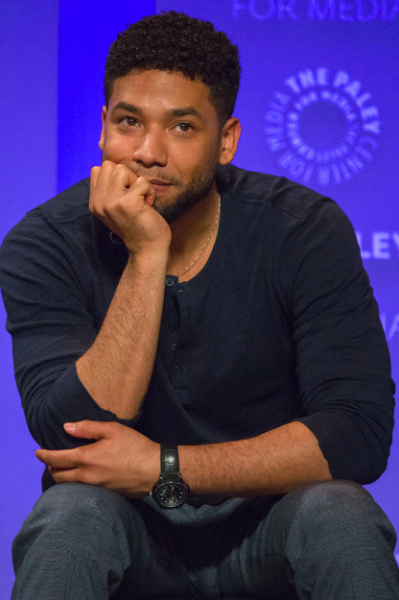 In any case, I’d never heard of Jussie Smollett until now, so in spite of the pain & suffering he’s endured, all the ensuing publicity is bound to enhance his career – & good for him. I wish him an even more successful & brighter future.